The Girl's school science fair seemed to be waiting until the last minute this year. 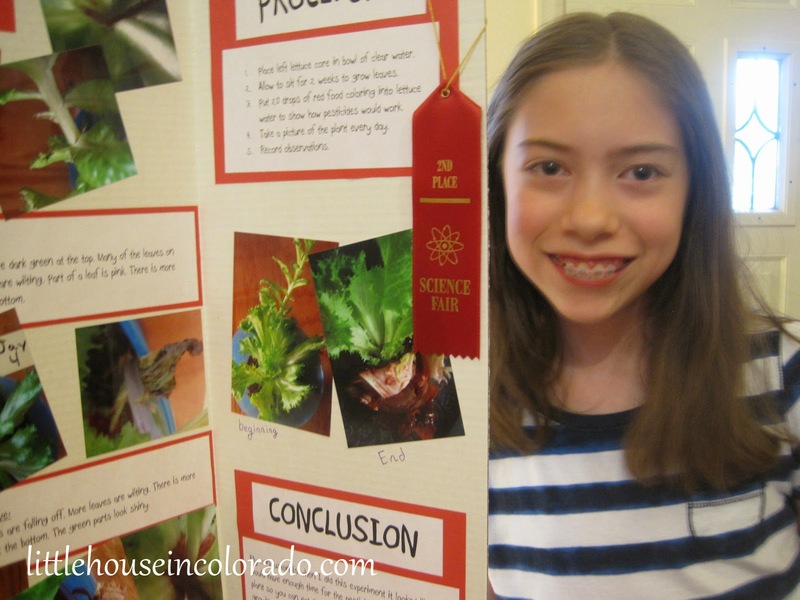 It was already a week into April by the time she finally announced the Science Fair date. May 14th. One month. Thank goodness we already knew what we would be doing! I am one of those crazy people who read gardening books all winter when I can't get outside to dig in the dirt. I don't usually have a problem with pests in my garden (except cutworms) but I want to be prepared if the creepy crawlies ever come around so I started researching organic pesticides and DIY pest deterrents. I don't use commercial pesticides. However, I do know pesticides have a "waiting period" between application and harvest. Someone MUST have studied this and deemed it safe to use pesticides as long as the instructions are followed correctly, right? Well, an article at OccupyMonsanto360.org had me thinking. The project idea is, pesticide is sprayed (or dusted) onto the leaves or sprinkled on the ground around the plants. Water (from rain or the garden hose) mixes with the pesticide and moves it into the soil. The plants drink the water (that now has pesticides mixed in) and pesticides wind up INSIDE the plant, unable to be washed off. Instead of actually using pesticide, we would use food coloring added to water. Note: I know this isn't really accurate/scientific. 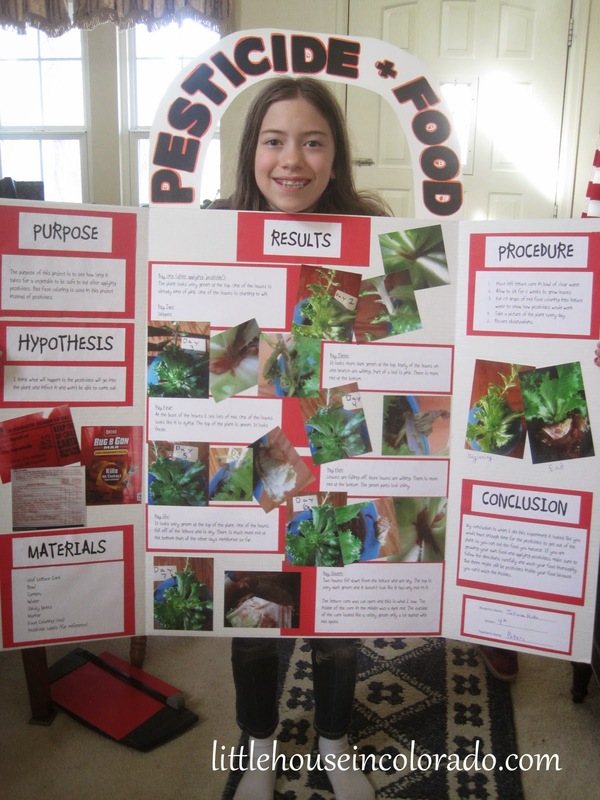 This is only a science project, not an argument for or against the use of pesticides. There are too many variables to deal with for an elementary school project. But my daughter never before even thought about pesticides and their effect on her food. Now she will...always. If course, The Girl didn't think the whole project was very interesting at first. She wanted to do something with animals. It wasn't until I showed her the photo from OccupyMonsanto360.org that she decided to go with it. I guess it looked colorful and pretty enough to sway her decision. The photo (at left), demonstrates pesticides moving through your vegetables. We couldn't do a "demonstration" project, though. We needed an experiment. I haven't used pesticides of any kind in years but remembering that "waiting period" between application and harvest Gave me an idea. We could work the "days to harvest" chart somewhere into the project and create a possibly eye-opening experiment. Basically, a "days to harvest" chart shows how many days to wait before harvesting your crop. In the experiment, we would "apply pesticide" (food coloring) and check the results after the allotted number of days needed to wait until harvest time. Our research was done with a trip to the hardware store. We snapped photos of the fronts and backs of several different pesticides (we didn't buy any) as well as a close-up of the active ingredient label. 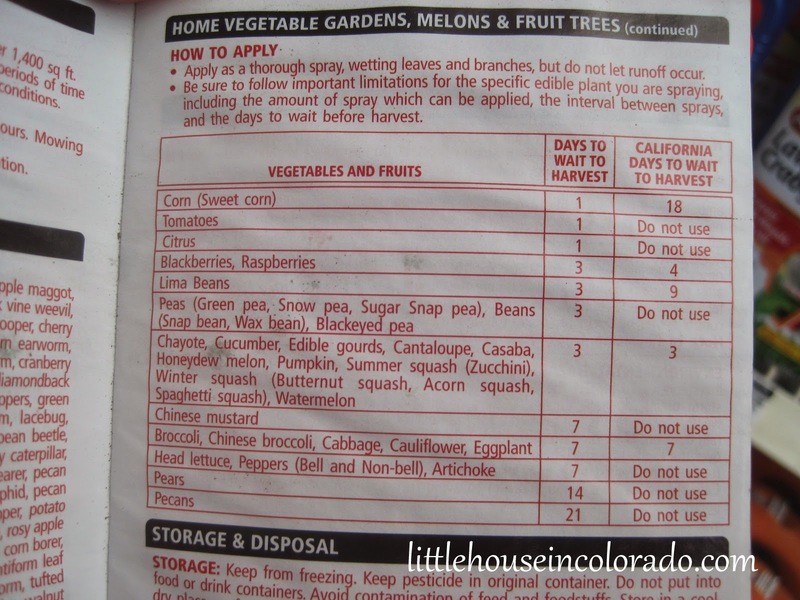 Then we searched for the "days to harvest" chart for each and took a picture of it for reference. The number of days to wait before harvesting crops varied with each pesticide and with each crop. And as we found on one pesticide, if you live in California, there were different rules/instructions. We wanted to be sure our plant specimen lasted at least 7 days - preferably until the science fair itself which was 14 days away. For that reason, I thought using a lettuce leaf (as shown in the occupymonsanto360.org photo above) was probably not going to work. 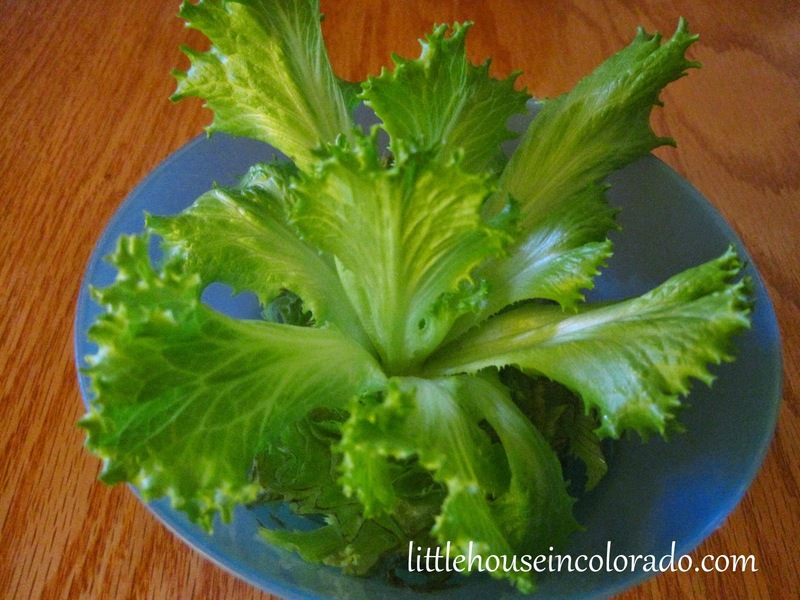 Instead, we cut off the base from a head of leaf lettuce and placed the entire core in a bowl of water. 2 weeks later, the core had sprouted a bunch of new leaves. We already had some sprouted lettuce cores that were about 8 weeks old (we use them to feed our tortoise) so we knew this new batch of lettuce would last as long as we needed it to...unless the food coloring destroyed it. The food coloring would only be added to the water on first day. This was our "pesticide application". On the following days, only water would be added if needed and The Girl would take a picture and record any changes. Theoretically, the food color should move through the plant becoming first saturated by color, then gradually being "washed" away by additional water. That way, we could see if the number of days to harvest was enough time to allow the pesticide to leave the plant. Note: Once again...I KNOW this is not very accurate. 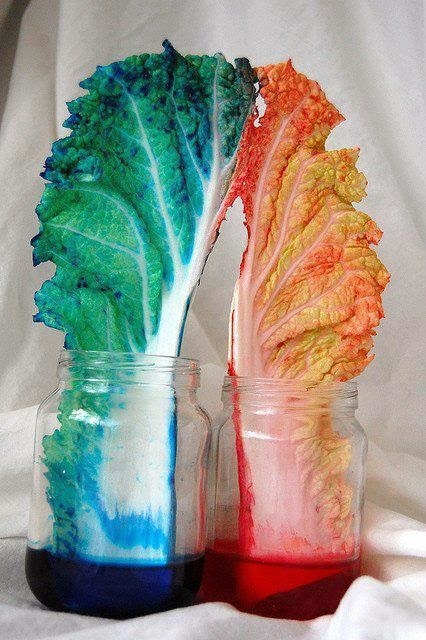 I am well aware the food coloring COULD stain the lettuce leave leaving permanent coloring and giving a false result. Fruit juice would stain, too. If you have a better option that an elementary school child could safely use, please share it. The Girl wound up with 2nd place. She was happy to have a ribbon...and red is one of her new favorite colors. Besides, it matched her display board. We agreed the 1st place winner (one of her best friends) had a VERY good experiment and deserved to win first place. She tested the effectiveness of various food saver/storage products to see which would work the best to keep mold from developing on cream cheese. We do wonder what kind of testing California has done on these pesticides to make their rules for using it so much stricter. If someone in California had determined the pesticides to be so dangerous as to not be used on certain foods AT All (see chart above), why is the pesticide still being allowed in other states? 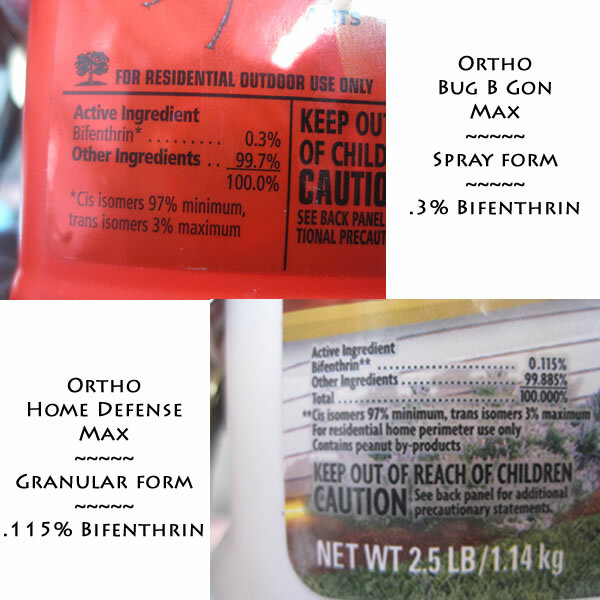 We noticed the Ortho Bug B Gon Max and the Ortho Home Defense Max both used the same active ingredient, Bifenthrin. Although the vegetable pesticide was a spray and the home defense pesticide was in granular form, the spray for your FOOD had A HIGHER PERCENTAGE of the active ingredient. And the Home Defense granules actually say "For residential home perimeter use only". So...I guess that means you're not supposed to apply it around your veggies? "Harmful if absorbed through skin." "Harmful if swallowed, inhaled or absorbed through skin." "Extremely toxic to aquatic invertebrates." "May kill honeybees and other bees." "Do not apply this product in a way that will contact any person or pet, either directly or through drift. Keep people and pets out of the area during application." These are just the cautions and warnings. I didn't see a list on the labels of possible side effects of exposure. I'd rather take the chance that a bug is going to nibble on my food rather than douse my veggies with poisons. What I can read says, "Storage: Keep from freezing. Keep pesticide in original container. Do not put into food or drink containers. Avoid contamination of food and foodstuffs..."